Jimmy: You get me a story even vaguely like that, and I'll dance all over them tables, bollock-naked. Sinead: I'm out this door and I'm selling tickets. And now for Joan Allen in a suspense thriller. What's that, you say? No, it's not The Contender, although she was very good in that. 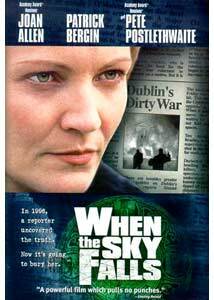 This time it's When The Sky Falls, a film, loosely based on a true story, about an Irish journalist trying to uncover the Dublin drug overlords. While not perfect by any means, the movie still develops enough momentum in the second half to keep it interesting. However, is it worth it to trudge through the rather torpid first half to get to the more interesting second half? I'd say yes, although some might argue that it is the Achilles' heel of the film. Joan Allen plays Sinead Hamilton, a take-no-prisoners investigative reporter who is trying to rid Dublin of its illegal drug trade. Her editor (Des McAleer, who was also in the entertaining An Everlasting Piece) loves her because she's single-handedly increased his newspaper's circulation by thirty percent. Criminals, especially "The Runner" (Liam Cunningham) hate her because she's making business harder to conduct, and her husband, Tom (Kevin McNally) loves her but hates what her job forces her to do. Sinead gets most of her information from Mickey O'Fagan (Jimmy Smallhorne), a local thug, who works for drug lord Dave Hackett (Gerard Flynn). Police detective Mackey (Patrick Bergin) put Hackett into jail for two years, but now Hackett is out, and Mackey is going to indict him in any way possible. To do that, he needs the information that Sinead has, while Sinead needs Mackey's information to write her news reports. The two form a symbiotic relationship that ends up being more dangerous than either suspect. When The Sky Falls is loosely based on the true life story of Irish reporter Veronica Guerin, and apparently doesn't stray too far from that story. However, this doesn't make up for the fact that the first half is slow and unexciting, and that the sympathies of both Tom and Mackey are too easily changed for my taste. For whatever reason, the first half just isn't interesting. Perhaps because the movie needs to introduce several characters and their relationships to one another, but that is done in a pretty concise fashion. No, even though there are car chases and raves and Molotov cocktails, the movie doesn't get good until Mackey decides to bend the law to get to Hackett. Perhaps this is supposed to show how trapped the police were in their procedures, but there's plenty of tension to be had when a policeman is close to the bad guy and can't do anything to the perp because of procedures. And as for Tom and Mackey, at the beginning of the movie, Tom absolutely hates what Sinead does. He thinks she recklessly puts herself and their son in danger. In one scene he is quite adamant about how he feels. The next time the subject is brought up, he pleads with her instead of holding his ground. The third time they talk about it, he is for her all the way. And the same with Mackey. At the beginning he treats her like a person who could be helpful, but is careful to keep her at a distance, because he doesn't trust the spin she'll put on any police action. Quite quickly he befriends her, and goes so far as to contact the IRA to help her. Mackey's conversion I can understand a little better than Tom's, but it's still a bit suspicious. Once the movie does pick up, it moves at a brisk pace, which may be the reason Tom and Mackey are so easily converted. The movie could not have picked up the way it did and still take the time to ponder the moral dilemmas that Tom brings up (by the second half, Mackey is so far out of the legal realm that he's in no position to bring up any moral dilemmas other than should the audience be rooting for a cop who so clearly oversteps his boundaries). Despite the flaws, the film is still quite enjoyable. The second half is certainly good enough to make sitting through the first half worth it. And the performances alone are reason enough to see this. Joan Allen is believable as both a hardened journalist and a loving mother (as well as pulling off an Irish accent that sounds completely in line with the rest of the cast). Joan Allen is a very underrated actress, and her performance here only adds to her underrated status. And the rest of the cast is uniformly strong, as well. Liam Cunningham, Kevin McNally, Jimmy Smallhorne, Gerard Flynn, and the other supporting cast all add something to the overall picture. The real standout is Patrick Bergin as Mackey. Bergin manages to play a hard-boiled cop while still retaining an inner core of kindness and compassion. He's not only believable, as a cop straining against a system that is letting criminals go free due to legal technicalities, he's the most fascinating character of the whole film, and Bergin captures all the nuances of the character. One small note: Pete Postlethwaite is only in the movie for about five minutes, hardly time to make any sort of impression. If you go into this movie expecting to see a lot of Postlethwaite, you're flat out of luck. Image Transfer Review: Ahh, if only all DVDs looked this good. The transfer here is immaculate. Each color is solid as can be, with no bleeding whatsoever. The delineation is really wonderful. Look at the scenes in Mackey's office, you can clearly make out the yellow sticky notes behind him, and you can see the gray of the message on the note. Such wonderful detail makes this a top-grade transfer. No artifacts or any other blemishes to be found. Audio Transfer Review: A pretty good audio transfer, too. While the surrounds aren't used too much, they're utilized well when called upon. For example, the car chase scene, where the cars go whizzing by in every which direction: they do so on the speakers as well. Also, the rave scenes have a particularly deep bass end, something that I love. Extras Review: John MacKenzie gives a feature-length commentary that is well worth a listen. MacKenzie intersperses production stories with comments about the on-screen action. Unlike most directors talking about the action, MacKenzie's comments actually add insight to a character's motivations or the core of a scene. To get a better understanding of the film on all levels, by all means check out this wonderful commentary. There's an untitled featurette that runs just over twenty minutes. I'd say about fifteen of those minutes are clips from the movie (in pan and scan, no less); the actual amount of information imparted is minimal. Rounding it all out is a theatrical trailer. When The Sky Falls is a thoughtful look at Ireland's drug problem, and the shortcomings of its previous legal and journalistic systems. While the first half shows severe flaws, the second half is sufficiently interesting to make the whole endeavor a worthwhile experience, and more of a success than a failure.